It’s important to find the cause of the problem. So the roof leak can be fixed before more damage occurs. Today, we’re going to help you identify what may be causing your roof leak and look at possible remedies. …That any roof leak is an urgent situation. Because, even if your roof leaks only when rains hard… Left unchecked (and unfixed), roof leaks can cause major damage. PLEASE BE SAFE – If you are a homeowner, and you don’t feel comfortable on your roof, please don’t hesitate to contact a professional. Many offer a free inspection or emergency roof repair services. Never climb on your roof while it’s raining. The bad things about slow roof leaks – the kind that only show up when it’s raining hard outside. In addition to the obvious (drywall and paint damage), when we look above your ceilings and behind your walls, you could be dealing with mold issues or structural problems with rotted wood. Slow roof leaks sometimes show up in the strangest places too – like water leaking from wall outlets or light fixtures. Sometimes water leaks behind walls and leaches straight into your hardwood floors or floor underlayment and causes damage there as well. Slow roof leaks can be deceptive, because what you see might seem minor. But what you can’t see might be devastating. If your roof leaks when it rains hard, you may have an issue in any one of the following areas. Skylight leaks in heavy rain are a common source for roof leaks. During installation, each skylight essentially creates a big hole in an otherwise uniform roof surface. 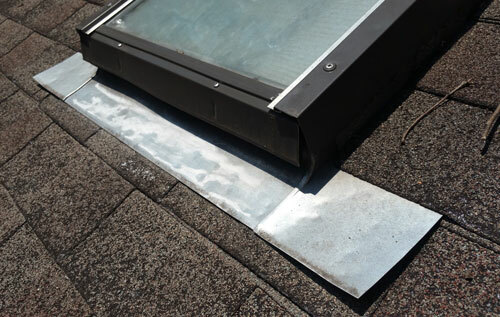 No matter how well your skylights were installed, it is still possible for them to leak during heavy rains. Especially as your home ages a bit. Although skylights are designed to shed water, the upper edge of your skylight is a flat surface, against which rainwater flows during a hard rain. 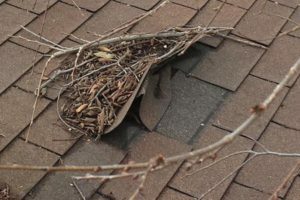 It’s also a location that can hold snow or ice and catch twigs, leaves or other debris that may have fallen on the roof. Over time, flashing and seals get worn out. Leading to roof leaks around skylights. Keep in mind that water leaking from skylights may not be wholly attributed to roof leaks from rain. Some skylights leak from condensation or from other water leaks that have traveled down rafters inside the attic. If your chimney leaks when it rains, you may have one of several different problems. It could be that your chimney cover is damaged or otherwise not working properly. Or perhaps the chimney crown is cracked or leaking. Or maybe you have cracks or gaps in the mortar or chimney veneer. But if you have problems with water leaking around the outside of your chimney down into your walls, you may have a problem with worn out flashing or sealant. And allows water to pool and sit during or after a rain. That leads to more rapid deterioration of flashing and sealants and allows water to leach into your home. Vent pipes penetrate all the way through the roof in several locations of the house, and each one needs to be maintained to keep water out. Vent pipe leaks during heavy rain can occur if you have cracks in your vent pipe boot or flashing. When your roof was installed, each vent pipe received a flexible boot to seal water around the round surface of the vent pipe. These boots vary in quality, flexibility and longevity. And over time… many vent pipe boots get hard and brittle as the punishing hot and cold cycles of sun, snow and ice take a toll on your roof. When the vent pipe boot cracks, your roof is open to a water leak. 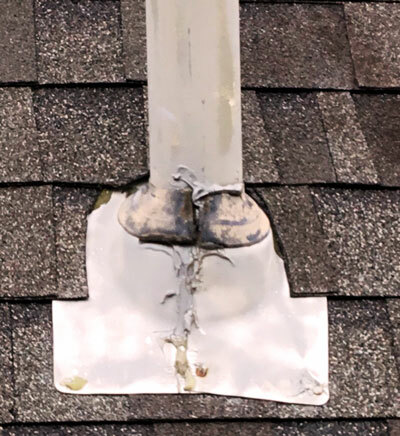 If your roof was constructed with cheap quality vent pipe boots, these will likely need more maintenance and replacement over the lifetime of your roof. Vent pipes are roof maintenance items that should not be overlooked. Periodic maintenance can prevent roof leaks. Roof vents serve an important purpose. They allow air circulation under your roof and allow air inside your attic to circulate with the air outside your attic. This keeps your attic cooler in the summer and helps extend the life of your roof. Roof vents come in a variety of styles. You may have a ridge vent, turbine vent, powered air vent or free air vent. Most air vent styles prevent direct intrusion of water. But some roof air vents sit fairly flat to the roof, with a mushroom style hood and unprotected sides. And on occasion a hard driving rain with whipping wind will cause roof vents to leak water. 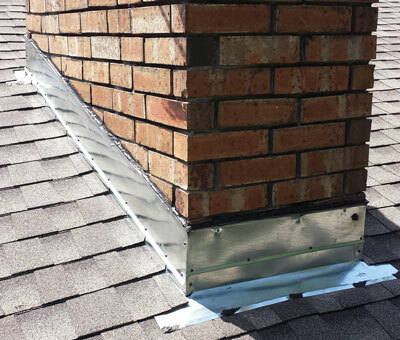 If your roof vent leaks during heavy rain, the rain may be blowing up under the hood and into the vent. It this is the case, you need to create a breathable shield to slow the driving rain drops while still allowing air flow. This video shows one possible way to do that. However, as with other roof penetrations, you may have a problem with holes or cracks in your flashing or sealant. Or the vent hood may be damaged in some fashion. If you notice water spots on your ceiling after rain, you may simply have damaged or missing shingles. Shingle damage could come from sun exposure, wind, hail, falling debris, ice or just plain age. Take a look at your roof. 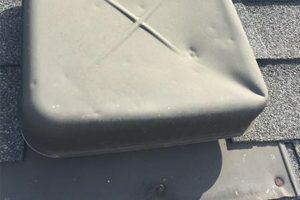 If you notice any spots where granules are missing from the shingle surface, you may have hail damage. Shingle hail damage can leave a crack in shingles over time and result in roof leaks. Also take a look at roof vents. If you notice dents or chipped paint, that’s often a good indication that you may have roof hail damage. If you notice large darker areas of of the roof, you may have had shingle blow off during a strong wind. And if you have tree branches, leaf piles or other debris laying on your roof, you may have a hole in your shingles from falling branches. Or you may have an area on your roof where water pools during heavy rain. Valleys in your roof are locations where two roof planes intersect and form a “V” shaped valley that runs down a slope of your roof. They are common on both hip and gable roofs. Valleys can be especially troublesome, because they carry a lot of water during heavy rain. And during the wintertime, roof valleys may be hold snow form the primary exit path when snow is melting. They also may be prone to forming an ice dam, which can cause bigger problems. The blocked valley creates a place for water to slow down and pool instead of running completely off the roof. Some homes do not include a separate ice and water shield in the valleys. Add to this that some roofers improperly place roofing nails near seams and low spots in the valley. 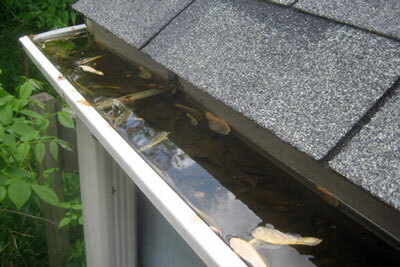 When your gutters are clogged, water is not able to flow away from the edge of the roof. This can allow pooling near the edge of your roof and can lead to water leaking into the eave areas of your house and down into your walls. In addition to potential roof leaks, clogged gutters can cause foundation damage, exterior wall damage and damage to your yard or landscaping. Another problem that may occur with gutters over time is separation from the house. 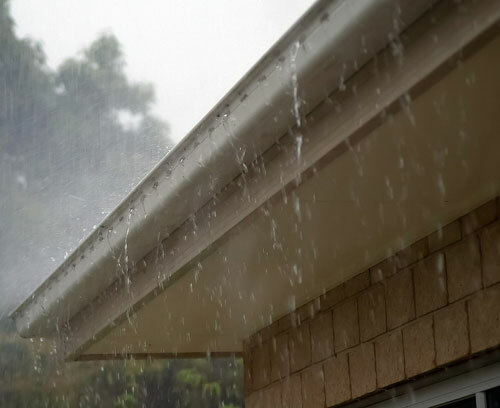 If water does not flow properly over the eave and into your gutters, you may have water leaking behind the gutter and leaching into your walls. The source for window leaks can be tricky to diagnose. If you notice a window leaking during rain, it could be a window leak. Or it could be a leak caused by your home’s brick veneer or siding. Even a pinhole leak in brick mortar can allow water to leak behind the brick. That has traveled down inside an exterior wall and is leaking around the window. Keep in mind that roof leaks may start much higher on the roof than the location where they appear. It could be that a vent is leaking further up on the roof, and the water is traveling down a rafter before entering the wall. We hope this guide helps you discover the source of your leaky roof while it’s raining. If it’s raining right now, take a peek in your attic and look for wet wood and dripping water. See if you can follow the path of the water to find out where the leak originates. Be safe. If you need professional assistance to help identify the source of your roof leak, contact your local roofing company. In addition to diagnosing the problem, a qualified roofer will be able to offer a safe, affordable and long-lasting solution to keep your home dry during heavy rains. If you live anywhere near Tulsa, Oklahoma, we would be happy to provide a FREE roof inspection and roofing estimate. Just call (918) 250-7663! We’ll be glad to help.